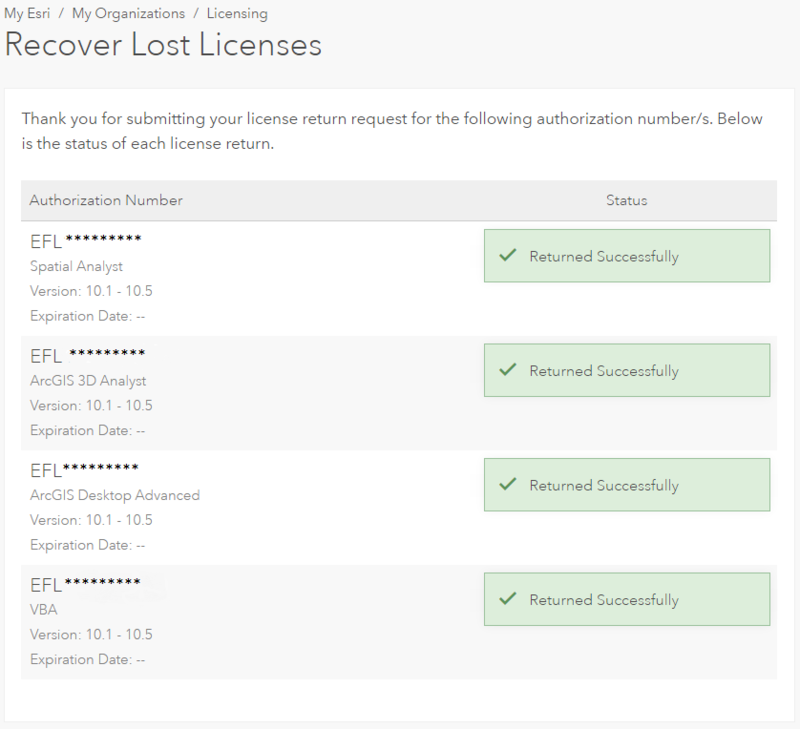 This article describes the steps to recover lost licenses from My Esri. 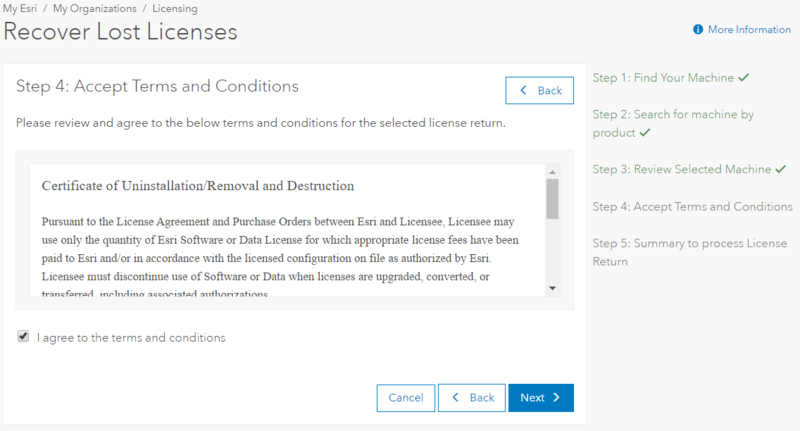 To perform the following steps, the 'Esri Admin' or the 'Take Licensing Actions' permission is needed. Sensitive information such as machine IDs, license numbers and other personal information have been obfuscated in the following screenshots. 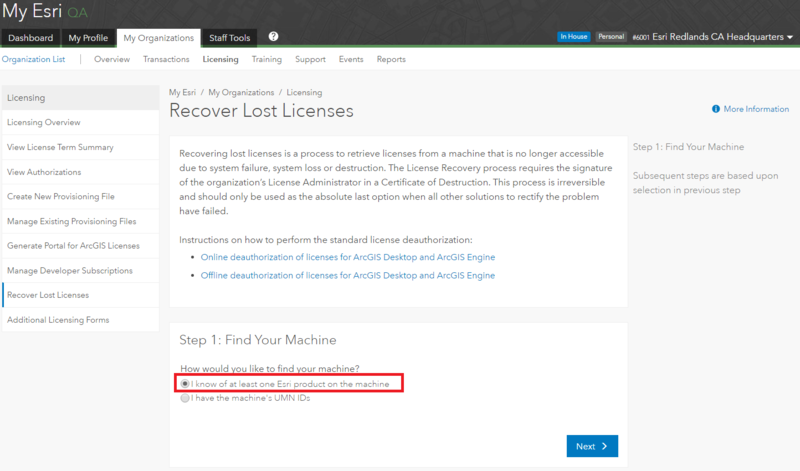 If the affected machine can still be accessed, do not use the Recover Lost Licenses option on My Esri. 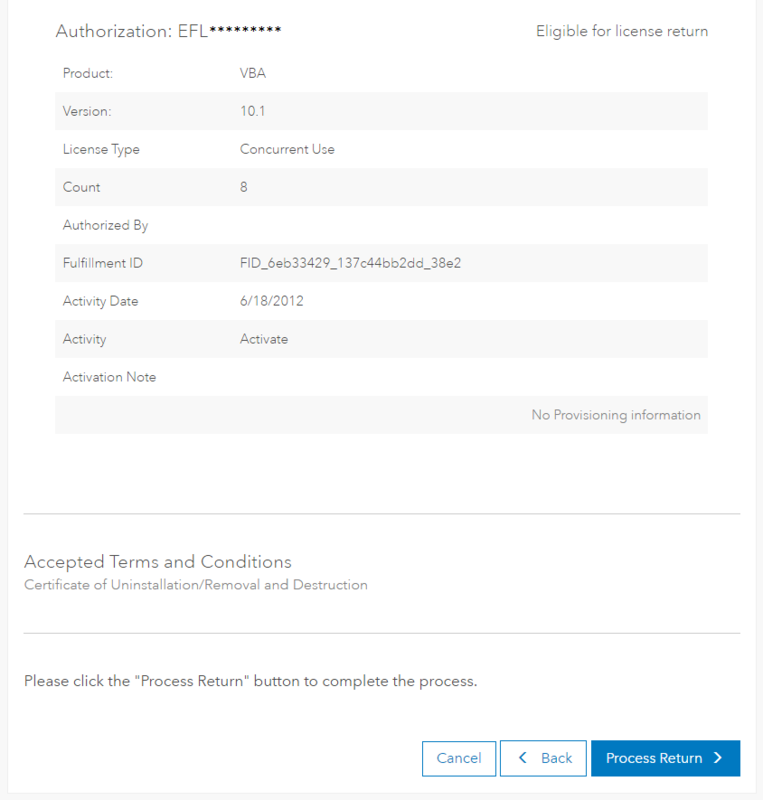 Follow the instructions in the articles listed in the Related Information section, below to deauthorize the license(s) instead. The Recover Lost Licenses is a process to retrieve licenses from a machine which is no longer accessible due to a system failure, system loss or destruction. The License Recovery process requires the signature of the organization’s License Administrator in a Certificate of Destruction. This process is irreversible and is used as the absolute last option when all other solutions to rectify the problem have failed. Log in to My Esri and click the My Organizations tab. Click the Licensing tab. 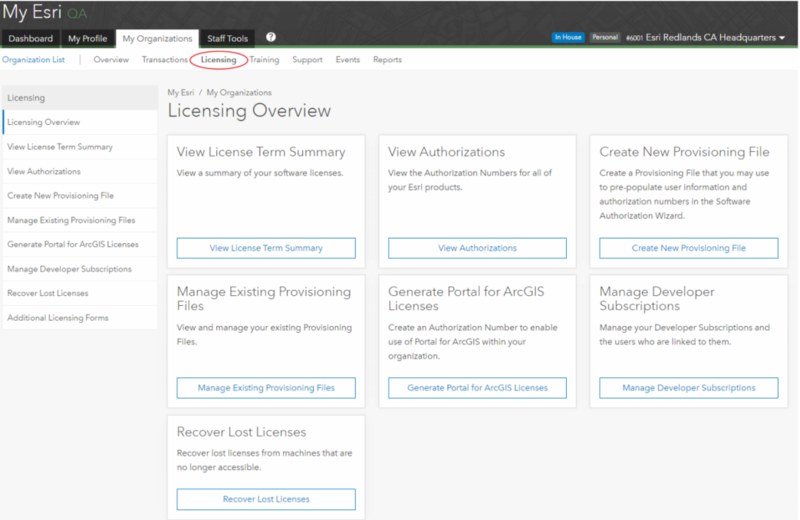 This brings up the Licensing Overview page. With the correct permissions, the Recover Lost Licenses option is shown. Under Step 1: Find Your Machine, select the first option, I know of at least one Esri product on the machine. Search for the machine by populating the drop-down boxes. Click Search. A list of results is shown. Select the machine from which to recover the license. Review the selected machine to ensure it is the correct machine. After reviewing the selected machine, the options to go back if this is not the correct machine, or to proceed with the license recovery process are presented. Review and agree to the terms and conditions. Click Next. Fully review the selected licenses to return. If the selection is correct, click Process Return. A confirmation screen showing the status of each recovered license is returned. Log-in to My Esri and click the My Organizations tab. Click the Licensing tab. 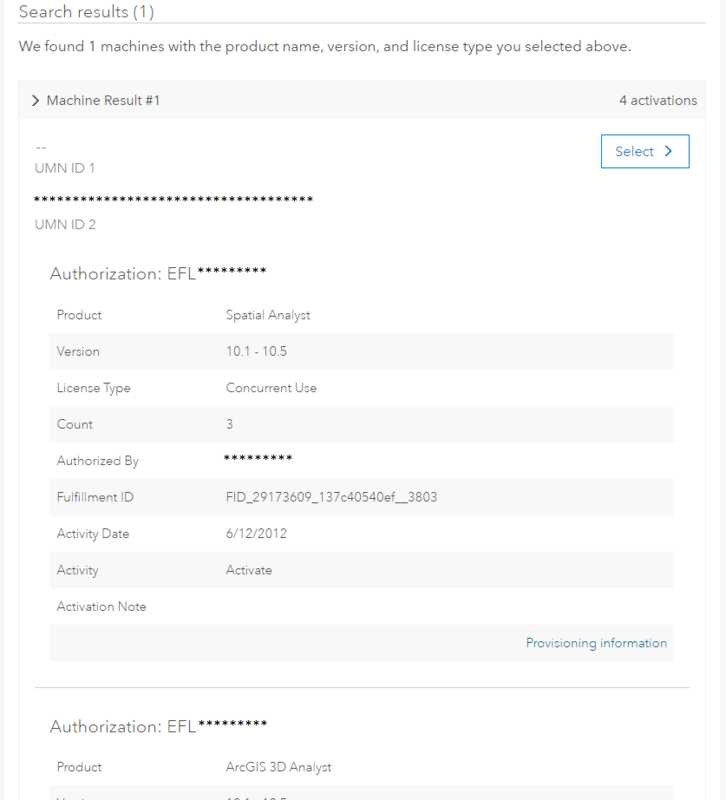 This brings up the Licensing Overview page. 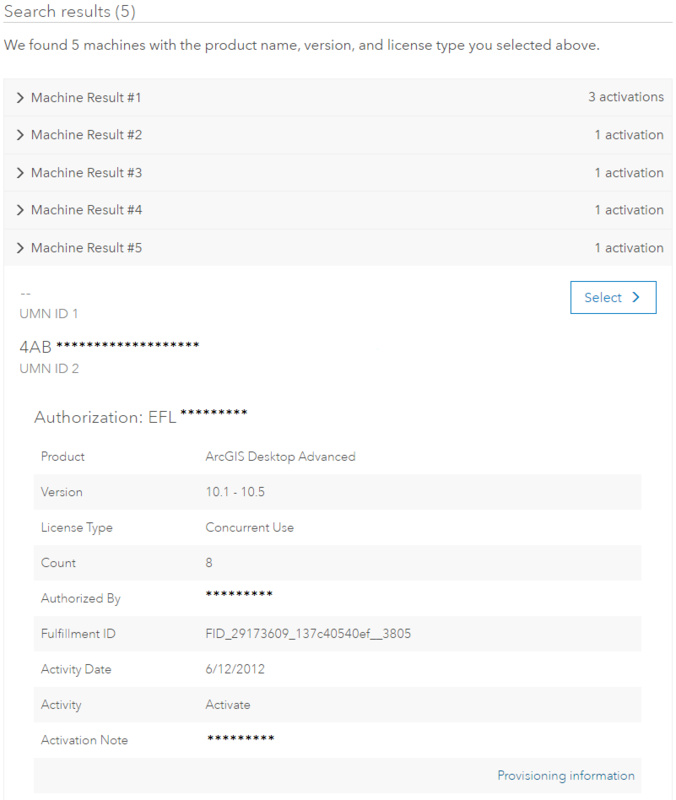 With the correct permissions, the Recover Lost Licenses option is shown both in the Licensing panel as well as a card. Under Step 1: Find Your Machine, select the second option, I have the machine's UMN IDs. Enter the UMN for the machine and click Search. A single result is returned. Click Select. Review the selected machine to ensure it is the correct machine from which to recover the license . After reviewing the selected machine, the options to go back if this is not the correct machine or to proceed with the license recovery process are presented. 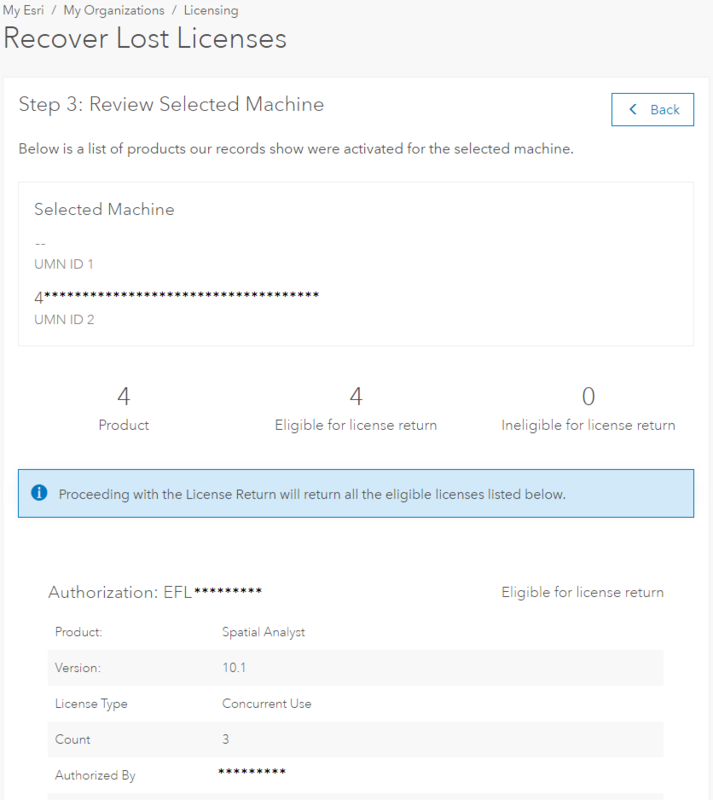 The recovered licenses can now be used to authorize a different machine. In the event of licenses not returned successfully, a summary of licenses returned and not returned is presented. In this case, work with Esri Customer Service or your local distributor to finalize the recovery process.